Compostable Matter: What Could Possibly Go Wrong? One of them could be the name of the steadfastly loyal gal-pal in a Public Television kids program. The other rhymes with weasel. Which one would you worry about? 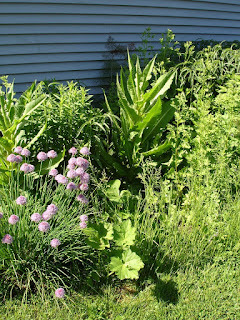 This looks to be a good year for the Hollyhock and Teasel in our yard. Both were unplanned additions to our perennial collection – about ¼ of which is similarly rescued or gifted. Both are biennials – i.e. their life cycles cause them to appear in public every other year. Unfortunately, both are followers of the even-year side of the calendar. Based on prior experience one of them appears not to feel the need to invite itself into locations other than the planting spot into which it was placed. Mars and I acquired the other biennial in October 2014, this will be our first actual experience with it. The Hollyhock came from New Mexico in 2008. Mars harvested the seeds from plants in the front yard of our daughter-in-law and son’s house in Santa Fe. 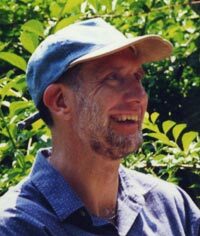 We flew back home with the dry, little kernels surreptitiously stowed in a Ziploc sandwich bag nestled within layers of soft clothing in Mars’ carry-on and scattered them into one of our perennial gardens at the start of the next planting season. Now, having done it, I can see how the thrill and danger of illegally (or at least pretend illegally) traveling across the country with illicit contraband may have gotten many of our now infamous international drug cartel chiefs started in the business. Mars and I could become “El Chapa” and (at a foot taller) “El Alto”. Anyway that first set of Hollyhocks drowned in the abnormally wet spring of the following year. So Mars brought back more seeds on our next trip west. And the pink flowers have appeared in our yard biennially every since. Thus far this year there are two. With luck more will show-up. They tend to hang around the same general area where they were planted in our garage-side perennial bed. 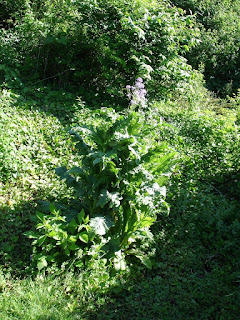 But most of that ground is claimed by other, more aggressive perennials, so the hollyhocks need to find an open space in order to get air-borne. Unlike their pushy neighbors, many of which they will tower over when full grown, our Hollyhocks seem to be willing to settle for what ever room they are given. Even though they are the centerpiece of the seal of the Tokugawa shogunate – the last feudal Japanese military government (1603-1867 ), our Hollyhocks act like the ones that I see in pictures forming a delicate pastel border around a genteel cottage at the Hamptons. 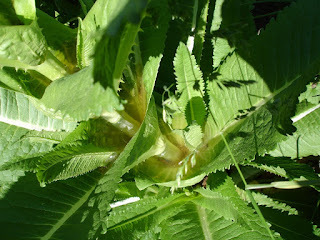 The Teasel however, although not part of any martial artworks that I know of, is already looking a little frightening. 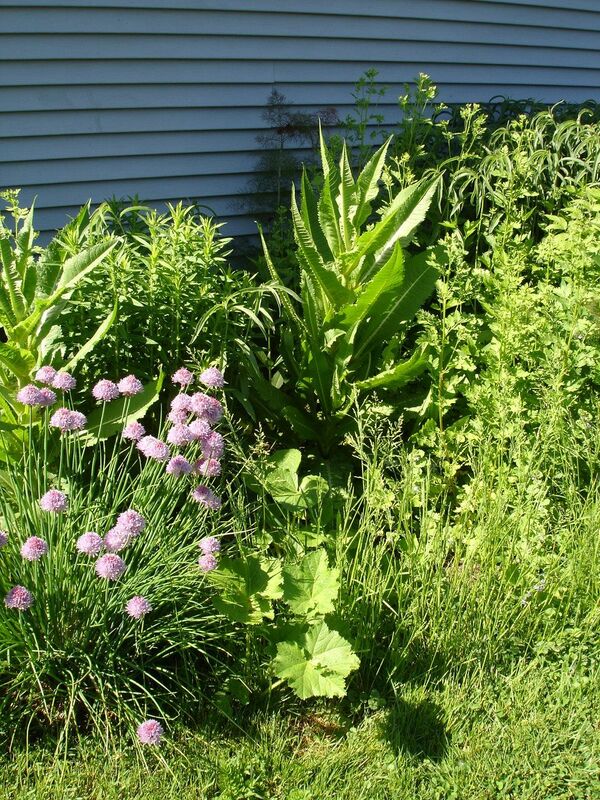 On the fourth day of a recent dry, 90-plus degree “hot spell” Mars called me over to our garage-side garden where two teasels are growing and asked if I had watered the now three-foot tall, large-leaved plant. I hadn’t. Then she showed me the pool of h2o sitting in the cup formed by the bases of the top-most foliage. I queried the Great Google and in an article called “The Teasel’s Water Tank” I read about the self-sufficiency and, dare I say it, belligerent attitude of our newest yard guest. It turns out that this water tank arrangement is a common survival strategy for Teasel and other plants that strive to survive in sometimes harsh conditions – hardly what it experienced at its former home and hopefully not at the current one, but evolution probably says it is better not to take any chances. Does this sound a little like the prototype for Audrey II – that vicious, raunchy plant that feeds on human blood, and is cared for by Seymour the Florist in the Broadway play and movie “LittleShop of Horrors”? 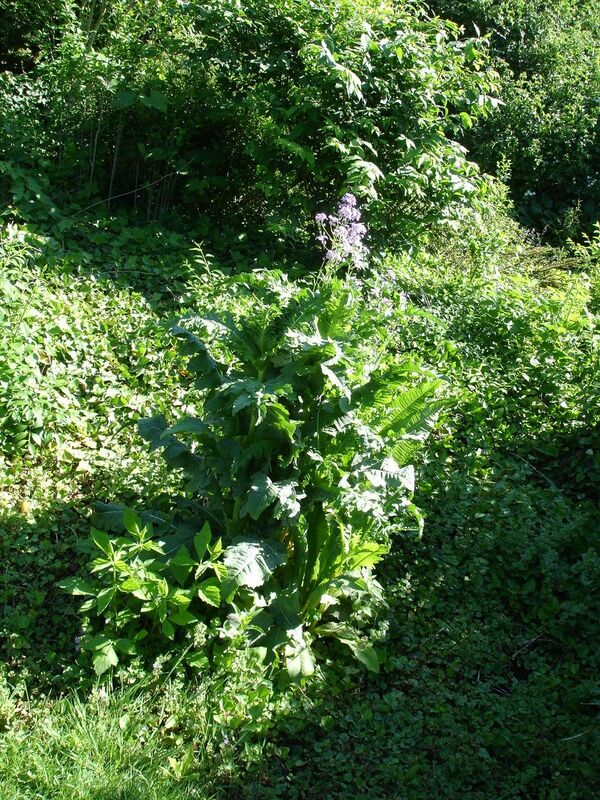 We acquired one teasel, a pair of agastache which we mistakenly thought were “just the right size” butterfly bushes, and a few perilla (a low-growing purple-colored member of the mint family) in August 2014 from the yard of a Master Gardener and grower of rare and unusual perennials who was selling her house and property to someone who was not a Master Gardener and grower of rare and unusual perennials. Mars was aware of the use of dried Teasel as tool in the processing of cotton – but other than that neither of us knew anything about any of these plants. They were home and in the ground before I learned of the potential invasive habits of all three. Last year the purple mint was the only one of the trio that showed signs of surviving the transplant. It has not however turned up anywhere on our property this season as of yet. The agastache meanwhile is standing tall with dainty pink flowers atop its slender three-foot tall stems exactly where it was stuck into the ground – and showing no outward signs of territorial aggression. There are however now a total of five Teasel (six including the one that I brought to my Garden Club's Plant Sale) that have situated themselves in two different beds each at a 60 degree angle from the original plant. I think they are positioning themselves to use (if you are a basketball junkie) the “triangle offense” developed by Coach Phil Jackson with his champion Chicago Bulls, or some other equally esoteric form of geometric attack strategem. And when I stand in the midst of their triangulated garden plan I think I can hear a small chorus of baritone voices singing Audrey II’s favorite song. Well that is what we gardeners want all of our plants to be – big and strong – right? I mean, what could possibly go wrong then? Ear Worm or Worm Hole?